After eating pasta and pizza all week long, I was ready to start cooking low-carb meals. 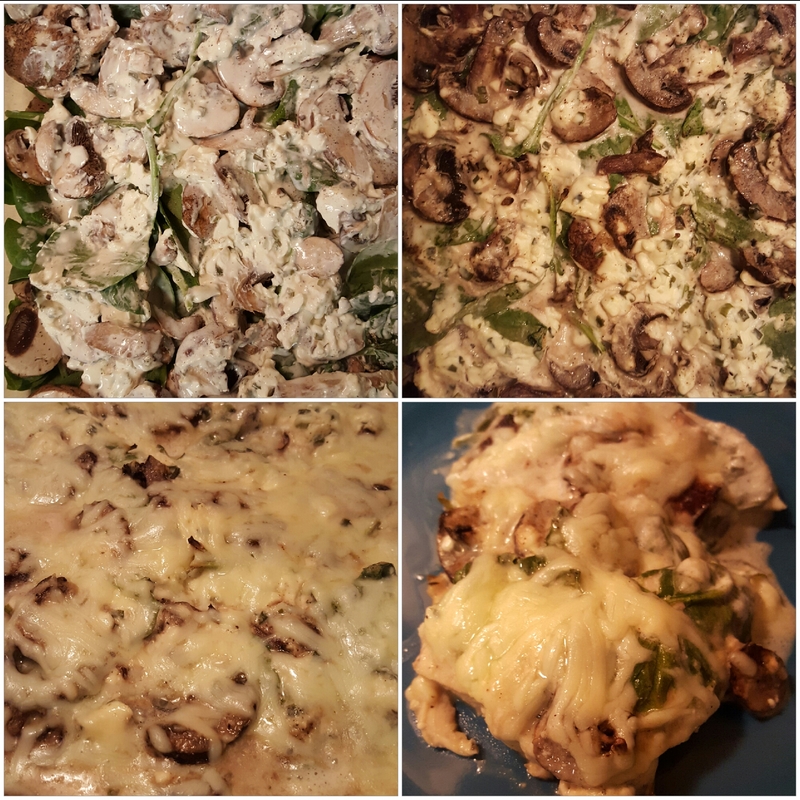 When This Mama is Losing It’s post about a spinach mushroom chicken recipe popped up on my newsfeed, it was serendipity. Swanson had contacted me about trying out their newly launched broths. 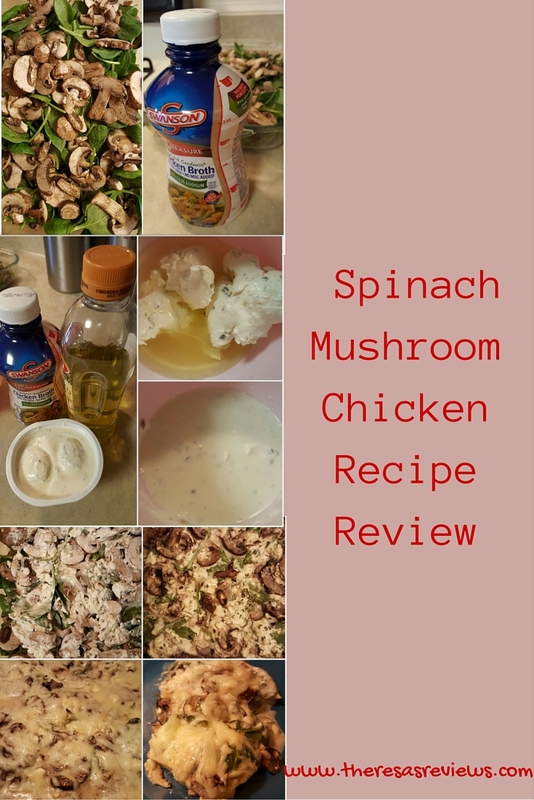 This recipe not only included broth, but it also had some of my other favorite ingredients, like mushrooms, spinach, and chive and onion cream cheese. With spring around the corner, this sounded way better than trying out a soup. Check out my review to see how simple it was to pull this off, and how delicious it tasted. This recipe was super simple, so I just had to share it! First, you take 1 pound of chicken, and slice it so it lays as thin as possible. You could use more chicken, but you need to lay it on a pan so it’s not overlapping for it to cook well. I brined the chicken for a couple hours using the Williams-Sonoma Herbs de Provence Quick Dry Brine. I can’t seem to find the quick brine anywhere now, so it must be no longer available, but it has the most amazing, subtle hints of French lavender and other herbs to infuse the chicken with flavor. 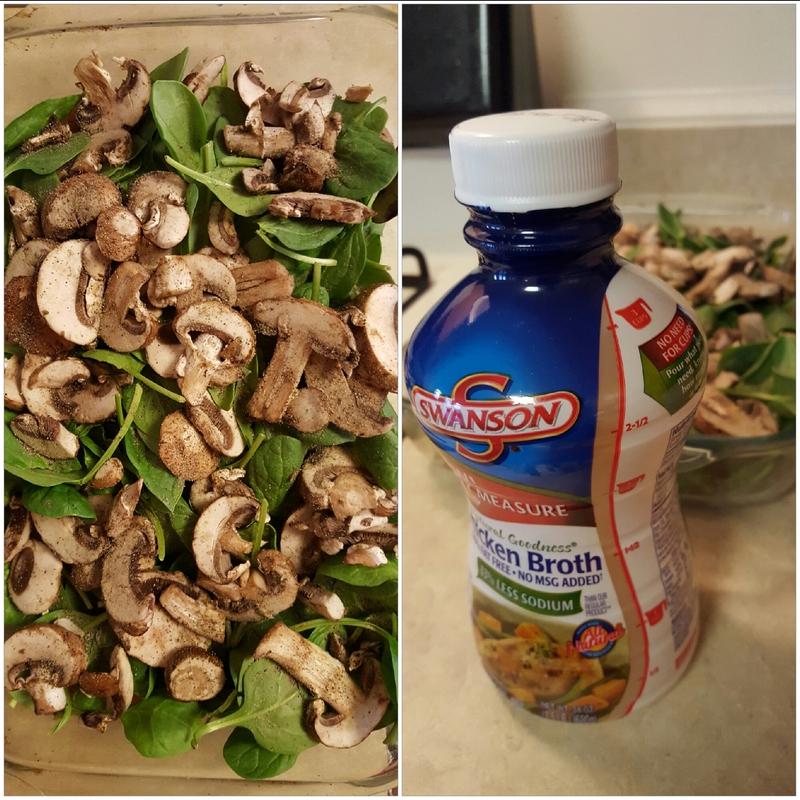 Then, on top of the chicken, I placed 1 box of sliced, washed mushrooms and about 1 bag of spinach. I bought a large plastic container of spinach, and I used about half of it. I added garlic seasoning and pepper on top. If I had real garlic, I would have tried it for a richer flavor. So far, it’s a dry mixture, since I haven’t yet created the delicious broth made with Swanson chicken broth and a couple other ingredients. Next, gather the following ingredients: 1/2 cup of chicken broth, 1/4 cup of olive oil, and 1 container of chive and onion cream cheese. Combine all ingredients in a bowl, and whisk it thoroughly. When you’re done, the mixture should be smooth and lump-free. This mixture was simple to make, and I loved the way it came out. The chive and onion cream cheese brought a lot of flavor. Also, this mixture wouldn’t have been the same without Swanson’s Natural Goodness chicken broth. I’ve always relied on their broth when I’m cooking. This newly launched bottled broth came with measuring marks on the side, to make it super simple to measure out the 1/2 cup. I loved not having to waste a measuring cup. After measuring the chicken broth, I estimated the amount of olive oil, and the consistency and the flavor was perfect. Pour the mixture on top of the dry ingredients. I used a spoon to smooth out the gravy so it would cover everything. This also helped catch any lumps that were left in the mixture. Then, lay foil over the pan without sealing it entirely. I placed the food in the oven at 375 degrees Fahrenheit for 20 minutes. I removed the foil and cooked it for 25 more minutes. Then, I added about half a bag of mozzarella, just enough to cover the top. I baked the food for 10 more minutes, uncovered. Overall, I stuck to the recipe This Mama Is Losing It provided, and the food cooked really well! The chicken was cooked all the way through, and the cheese was melted just the right amount. All of the vegetables were cooked well too. This recipe was a huge hit with my family. We had been eating pasta once a week, pizza here and there, and rice with every dinner. Skipping carbs with our dinner was a nice break! I would definitely cook this recipe again. I loved how simple it was to make. Tossing vegetables in a pan to bake is a lot easier than sauteeing them. The prep time was minimal since everything came pre-sliced, and I didn’t have to worry about doing much other than checking the oven from time to time. Do you have a favorite carb-free recipe? I’d love to discover some more! With the warm months coming, it’s time to eat healthier. Share your healthy recipes in the comments section below! Oh my word this looks delicious! I love recipes with mushrooms. And chicken is one of those things I don’t often screw up 😉 Definitely need to try this! This looks like a great idea! I’m a vegetarian, so it actually inspired me to try something similar based on this! I would have never thought of it 🙂 Thanks!